Johann Köler enrolled 1848 at the St. Petersburg Imperial Academy of Arts. It was the only institution of higher education in Russia that based its approach on the positions of academic art. Köler was a successful student, even though he suffered from overworking and material privation. Even though Köler graduated from school, his graduation works were not sufficient to earn him a scholarship for travelling. Luckily, a prince asked the beginner artist to paint a portrait of the tsar and paid Köler 1200 roubles for that work. Additionally, Count Sievers commissioned an altar picture of Christ on the cross from Köler for the church in Võnnu, which Köler promised to paint over the course of the trip he was about to embark on. Thus he could count on the amount he would receive for that work. 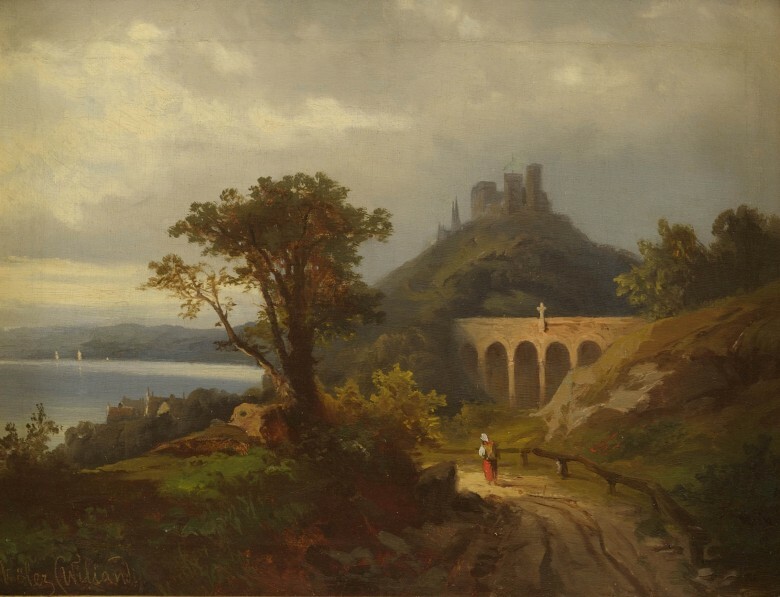 On top of that, Köler was informed in November of 1857 that he had been awarded a two-year scholarship for travelling abroad from the Society for Fostering the Arts. Köler left St. Petersburg in June of 1857, travelled throughout half of Europe and arrived in Paris by the autumn of that same year. On the basis of the portraits and sketches he completed there, it is maintained that at that time, Köler still adhered to the classicist principles insisted on at school. Köler went to Italy in the spring of 1858, finally arriving in Rome. He lived there for the following years, taking occasional trips to Southern Italy, for instance, to say nothing of painting expeditions to the mountains near the city. Köler suffered from a shortage of material comforts and his health was not particularly good, yet he started working immediately and also learned Italian. His four-year period of working in Italy was intensive and according to the recollections of a contemporary, he “quickly gained recognition there through constant work”. There is general consensus that Köler’s style of painting changed in Italy and he withdrew ever more from strict academic requirements. Several reasons have been enumerated for why Köler’s style changed. Just the fact that he was away from assignments set by school for the first time and for so long and worked independently probably had its effect. Different influences from Paris but also from Italy can also be pointed out. Additionally, various authors cite the fact that Köler started working in nature on painting landscapes as another reason. That genre was not particularly respected at the academy in St. Petersburg and Köler was introduced to its possibilities for the first time in Italy. Köler painted near Rome as well as farther afield. The subject of this painting is said to be the Campagna Romana Subiaco located in a part of Lazio County. Subiaco is near Rome and is prominent for its many abbeys and churches, yet it is hardly likely that the area’s religious spirituality attracted Köler. The number of landscape paintings that Köler completed in Italy is considered to be scant. It may amount up to 40 (including studies and preparatory drawings) according to different estimates. 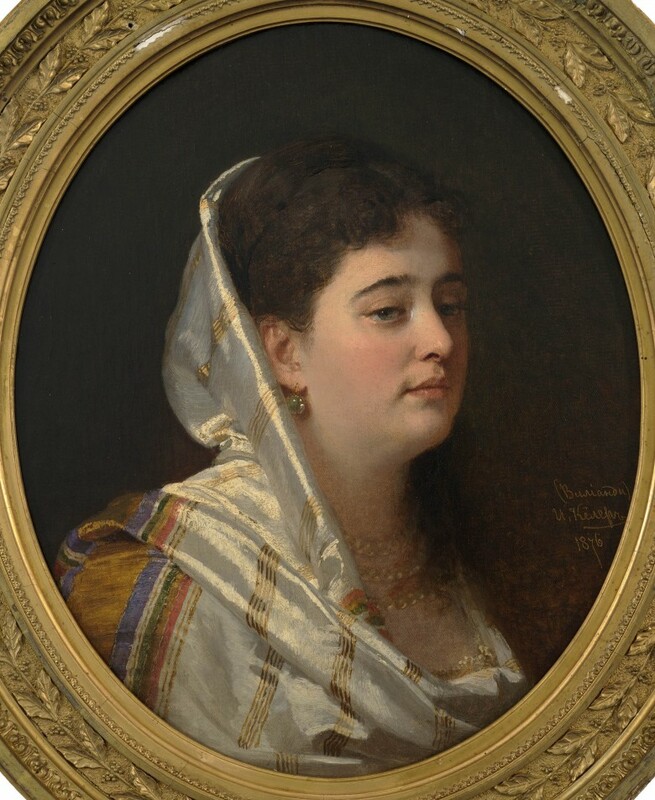 Johann Köler lived in St. Petersburg again in 1876, where he had been the Grand Duchess’s, in other words the tsar’s wife Maria Aleksandrovna’s art teacher (the subject of the portrait is nevertheless not her). According to some sources, this portrait belonged to the collection of the writer Leo Tolstoi.